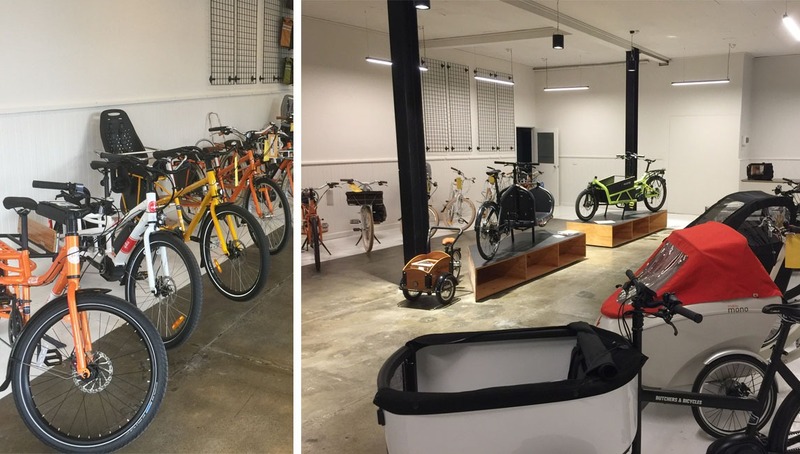 Cargocycles is a bicycle business specialising in cargo bikes, load carrying bikes and electric bicycles, located in Brunswick East, Melbourne and we are family owned and operated. Not only do we have one of the largest specialist Cargo and Electric bike showrooms in the world, stocked with a huge array of Cargo, Electric, Kid’s and Standard bikes we also have a huge warehouse attached to our showroom that holds all the bikes we can’t fit on the floor. If it’s in stock on our website, we have the bike physically in stock ready to go, and with our long standing relationships within the industry we are also able to quickly source most other models … just CONTACT US to find out. We firmly believe the investment in a Cargo or Electric bike should include expert advice, the ability to test ride all the options and then the follow up and support of a dedicated workshop and trained technicians. Our dedicated workshop specialises in maintaining the bikes we sell, including lifts for the larger bikes as well as testing equipment for the electrical systems. We also specialise in building and supplying electric conversion kits from manufacturers such as Bionx, eZee and Solarbike to your existing bike. We are supported by a large dealer network throughout Australia, who are able to supply our range of bikes to you if you live farther afield. See OUR STOCKISTS for details. Cargocycles is committed to minimising our environmental impact and we are keen to help you do it too. We are not car hating crazy people, we understand some trips can only be made by cars, vans and trucks but we do believe that some of these trips can be replaced with a vehicle with a smaller footprint. Our bikes can help customers reduce their environmental footprint by replacing short car trips with human and electric powered transport, and we try to bring them to you with as little environmental impact as practical. Moving objects around the world costs energy. Surface transport (ship, rail, road) is far more energy efficient than air freight. We use only sea freight to import our bikes, and regular (non-express) surface freight for deliveries, to minimise environmental cost as well as financial cost. The less freight is rushed, the more efficiently it can be handled. If an express road transport carrier has a choice between sending a half empty truck or missing a “next day guarantee” deadline, the truck will run half empty (probably following another half empty truck up the highway). Having a cargo bike delivered is exciting, but it’s not time critical. Regular road transport is usually just as fast as express, but may occasionally slip a day in transit. We appreciate your patience. We welcome your comments, questions, and suggestions of how we could improve our business to be more environmentally friendly. Use the contact us page.